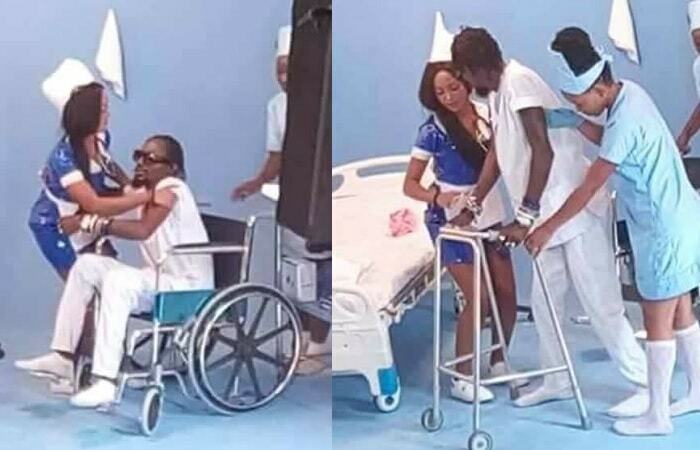 You must have seen the pics that have singer Moze Radio in a wheel chair and a hospital bed depicting a picture that the singer can now move and walk, he is besides some curvy nurses. Those are video vixens and that was a video they were shooting a few days back, unfortunately, it can easily be confused with the current condition to link it to a stunt. It should be recalled that just last week, Moze Radio, Weasel and Spice Diana were in the final stages of releasing their latest video dubbed Chuma, those are some of the pics that were taken during the shooting of the video. Moze Radio's last speech was during Spice Diana's graduation party where he was clad in a military fatigue, he gave a short 'fire burn dem' speech congratulating the Bimpe Nabino Bwoy singer on her latest achievement, he then bounced off like Bobi Wine. The pics in the video are so confusing that they make it look like his current condition is a stunt to pave way for the video, in fact, the release of the Chuma video has since been rescheduled to a later date when they are sure that the Gooldyfe soldier is fully recovered. His condition is still critical. The owner of the Bar in Entebbe where he got this problem has been arrested and one other to help with the investigations. Fans, friends and family have since been sending get well wishes and comforting messages. Moze Radio's baby mama of two, Lilian Mbabazi, who is currently in Rwanda is still in shock.